Posted by David S. in Burglaries, Incidents, Law Enforcement. A candidate for the World’s Dumbest Criminal Award. Posted by David S. in Burglaries, Incidents, Law Enforcement, Robberies. 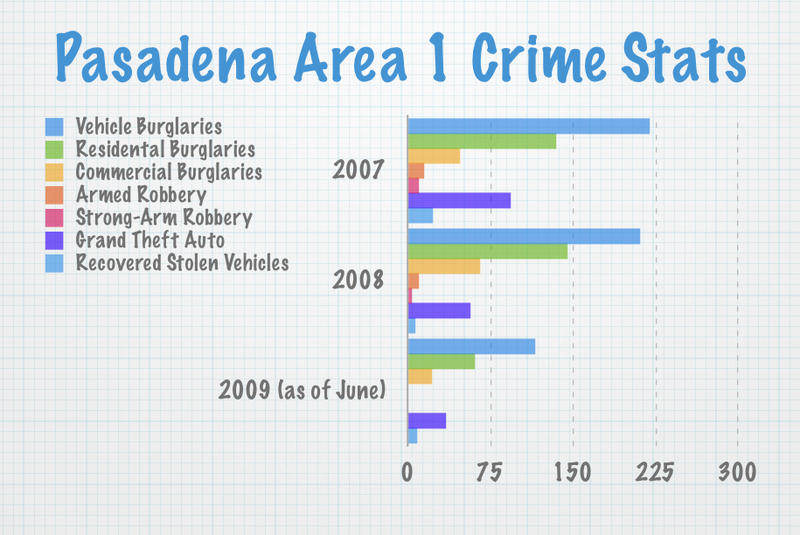 Courtesy of the Pasadena Police Dept., here’s an overview of Pasadena’s Area 1 Crime Statistics from 2007 up to June of 2009. As soon as more data becomes available this graph will be updated. Click here for a more granular look at the numbers (posted on the West Pasadena Residents Association site). Click on the graph to see it full size. Posted by David S. in Burglaries, In the News, Incidents, Law Enforcement, Robberies. Two teenage boys used a handgun to carry out a home invasion robbery Friday, police said. The crime occurred about 6:30 a.m. at a house in the 1100 block of Romney Drive, Pasadena police Lt. Chris Russ said. A 47-year-old man and a 45-year-old woman were home but were not injured, the lieutenant said. “They were in bed when they awoke to suspects inside their home,” Russ said. One of the robbers pointed a gun at the man, as the crooks proceeded to help themselves to a laptop computer, a Rolex watch, a small amount of cash and other items, he said. They also stole a key to car parked in the driveway, but were apparently unable to start it after they jammed the key in the ignition, Russ added. “As the suspects were leaving, the male victim came outside and confronted them,” he said. The armed robber fired one shot at another parked car belonging to the man, Russ said, before fleeing on foot toward Church Street. Police searched with a helicopter and a bloodhound but were unable to find the robbers, he said. One of the robbers was described as a Latino boy of 15 or 16 years old, about 5 feet 6 inches tall and between 140 and 150 pounds. He had short black hair, wore all black clothing with black tennis shoes and carried a small silver handgun. The other robber was also 15 or 16 and was either black with a light complexion or Latino with a dark complexion. He had short black hair, a white t-shirt, light blue jeans and tennis shoes. Posted by David S. in Burglaries, Helpful Hints, In the News. Posted by David S. in Burglaries, In the News, Incidents, Law Enforcement. PASADENA – Police arrested four men believed to be connected with a string of car break-ins following a brief car chase on Friday, officials said. Jeffrey Morquecho, 18, Adrian Bernhardt, 18, Sean Marshall, 18, and Brent Gorman, 24 face charges of vehicle burglary and grand theft. Gorman will face an additional charge of felony evading an officer, Pasadena Police Lt. Keith Jones said. About 6 p.m. on Thursday, a motorcycle officer observed four people in a car at Pasadena Avenue and California Boulevard. The officer made a traffic stop. The driver pulled over the car, which was reported stolen out of the La Crescenta Valley Sheriff’s Station. When the officer approached the vehicle, the driver sped away. After gaining a small lead, the driver parked the car at Fair Oaks Avenue and California Boulevard. The men them jumped out of the car and ran away. They were all caught and arrested, Jones said. Greetings to all and I hope everyone had a safe and happy 4th of July holiday. Pasadena Police Officers arrested burglary suspects after a concerned citizen telephoned our Communications Center reporting suspicious activities of several young men. These young men were going door to door in his neighborhood, but then the citizen observed the men coming out of a neighbor’s back yard, and the citizen knew that the homeowner was away. The citizen relayed pertinent information to our dispatchers. Police stopped the suspects and recovered stolen property taken from the residence of an absent homeowner. This was excellent action on the part of the observing citizen, and Detective Sergeant Lomeli has told me that it is greatly appreciated when our folks contact PPD regarding suspicious activity, solicitors, etc. Also of interest, arrests of suspects in other cities’ burglaries were made by South Pasadena Police and La Crescenta Sheriff. While they are not all the same suspects as the persons involved in the PPD arrest, there are some related threads, and PPD detectives are attempting to determine if any of these other suspects were responsible for Pasadena crimes. It seems like every time I open the paper (or my email software) there’s more news about burglaries in Pasadena. This is one of the wildest. Pasadena police detectives have arrested a second suspect in a burglary gone awry that landed one woman in the hospital with a gunshot wound. Police arrested Oswin Moreno, 18, of Pasadena at a home on Summit Avenue at about 10 p.m. Wednesday night, a few hours after arresting his alleged accomplice, Jorge Mejia, 21, also of Pasadena, officials said. The arrests came after a series of events that began about 11:30 a.m. Wednesday, when a 49-year-old woman pulled into her driveway on East Ladera Street and saw two men robbing her home. One of the men shot her before fleeing on foot with his partner, police said. They could not drive away because the woman had blocked their car in her driveway. A neighbor chased the men and was able to help police immediately arrest one of them, later identified as Mejia, police said. Police stayed on scene until late into the night, speaking with neighbors and searching the area with police dogs until information led them to Moreno, police said. Police are still looking for a weapon. Charges will likely be filed against the two today, police said. The woman remains in stable condition. Surveillance photos catch miscreants in the act. Recognize anyone? Posted by David S. in Burglaries, Helpful Hints, Incidents, Law Enforcement. A good afternoon to everyone and happy October 1 – Halloween is just around the corner and hopefully some cooler weather and don’t we and the plants and animals need that!! In talking with PPD Detectives, the following information they would like me to pass along to my citizens so they can make their neighbors/friends aware of some recent trends in our city. There have been garage burglaries during the past week or so where the burglars cut the hasps on the garage door with bolt cutters. Bicycles have been stolen in several of the burglaries. Other unsecured garages have been burglarized and taken were items ranging from miscellaneous tools to more bicycles and a golf club carryall. 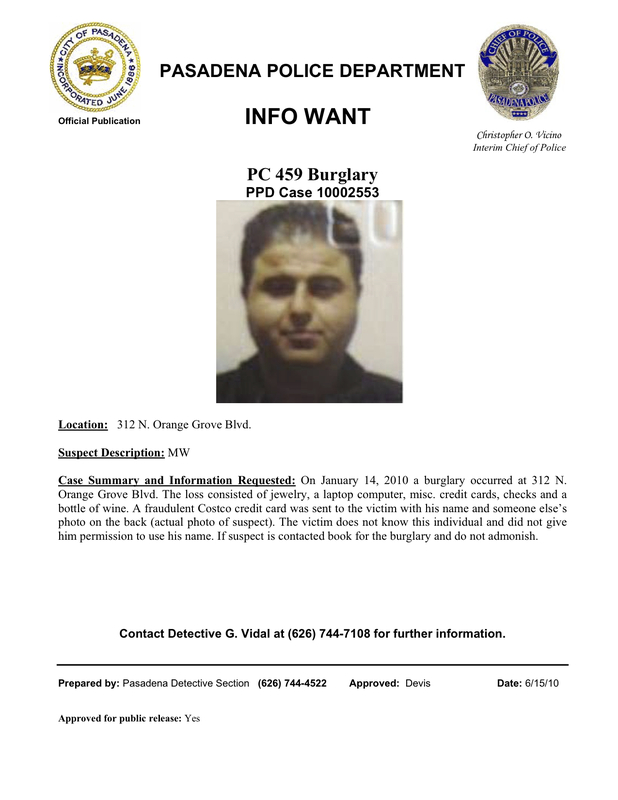 There have also been thefts of delivered items left on porches around town, and this is also occurring in neighboring communities such as Sierra Madre and Arcadia. Of particular note, please help your older neighbors stay safe. There are suspicious individuals coming into the city. In one example, two subjects knock on an elderly resident’s front door and try to sell him a product. One of the sellers asks for a pen, glass of water, etc. When the elderly resident walks away from the door, these “salespeople” enter the home and start looking around. Luckily, in the above described incident, a neighbor saw these people enter the home, knew something was not right, and went over to the elderly neighbor’s house, at which time the two “salespersons” left in a hurry. We mentioned before to be sure and secure your doors and windows, especially when retiring for the night. Case in point: an older lady went to sleep one night and forgot to lock her door. She woke up to find an intruder going through change on her dresser. She screamed and he ran away, so luckily she was unhurt, but this could have ended very badly. Our friendly and helpful Auto Burglary detective is pleased to inform folks that burglaries in the areas of the Rose Bowl and Eaton Canyon Nature Center have decreased 25% to 30%, possibly due to the apprehension of a couple of suspects. To assist in this trend, remember to remove everything from your vehicle and keep it locked even if it is parked in your driveway or in front of your home. Pass this along to your kids, as sometimes when they arrive home from school, they forget and leave things like laptops in the vehicle. One thing that the Detective is starting to see is fuel theft from vehicles. The thieves burglarize the vehicle so they can open the gas door and siphon the fuel. Citizens may want to give consideration to having a key locking gas cap as a deterrent. Burglary of vehicles parked in underground garages is apparently random and more likely a crime of opportunity. Video cameras can be effective of these areas. With the situation of the economy, continued vigilance and awareness of our surroundings cannot be emphasized enough. Like our Detective says, reporting of suspicious activity and just paying attention to your surroundings can do a lot towards keeping our citizens safe. Posted by David S. in Burglaries, In the News, Law Enforcement. Authorities recovered more than $100,000 worth of allegedly stolen jewelry, as well as a large cache of computers, electronics and other stolen goods in a series of search warrants carried out Friday and Saturday. Two men were arrested Friday in connection with the allegedly stolen merchandise, which is believed to have been taken in a series of residential burglaries across the San Gabriel Valley, Los Angeles County sheriff’s Sgt. Brett Hanson said.